If you're descending on London for fashion week, stop by Clarins' temporary store for a quick pick-me-up! SEE ALL THE LATEST STARS TO GRACE THE FASHION WEEK FRONT ROWS HERE! The cosmetics connoisseurs are opening an exciting pop-up store to coincide with the flurry of fashionistas hitting London – featuring all sorts of beauty-based treats. Not only can you stop by for a quick drink at their juice and cappuccino bar, but you could take advantage of their free one-to-one skincare consultations or treat yourself to a complimentary Energy Recharger facial – a 40 minute treatment with one of Clarins’ leading beauty therapists to detoxify and rehydrate skin. Our advice? Better book quickly – those appointment slots will get snapped up pretty swiftly! The shop will also showcase a whole array of Clarins products, including an exclusive preview of their brand new Daily Energizers range – five gentle plant-bases skincare products designed specifically for younger skin. But if all that weren’t enough, the store will also be hosting guest appearances throughout its 10-day run, including global tanning expert James Read, and celebrity nail technician David Barton. The Clarins pop-up shop will be open from 10.30 am till 6.30pm, from 17th to 26th February. 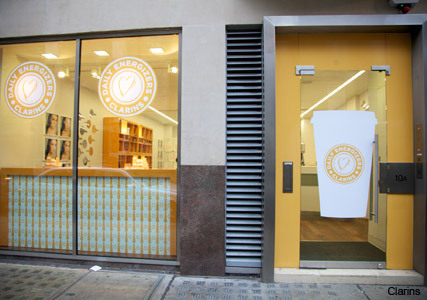 Check it out for yourself at 10a Blandford Street, London, W1U 4AZ (just off Marylebone High Street).